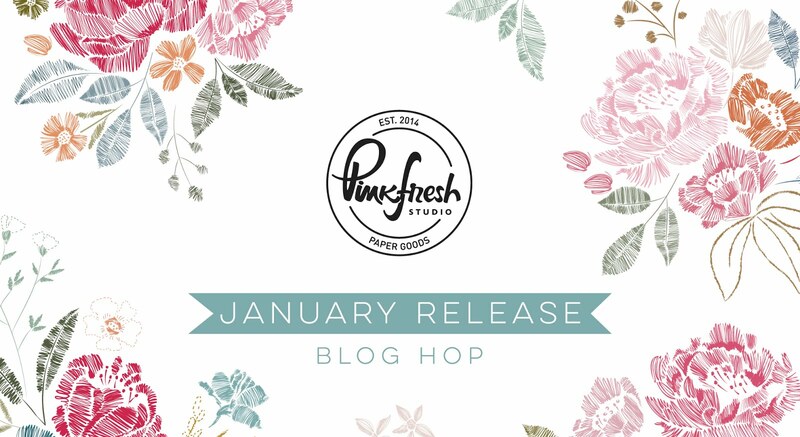 The winner from my blog is: Farhana S.
Welcome to the Pinkfresh January Release Blog Hop! You should have arrived from the talented Natalia Valkovskaya's blog. I am so honored and excited to be joining this hop of amazing cardmakers. Pinkfresh has a big release, so the hardest part was deciding which products to use. I couldn't resist the adorable Folk Elements Stand Alone dies. They come with a magnet inside the packaging. They have the cutest details to them. I started cutting several in colors of blues, reds/pink and yellow to go with the folk look and feel, but these would be precious in pastels as well. I wanted to add a lot of color to my background. On the first card, I used 1/2" strips of cardstock, but the Pinkfresh pattern papers would be perfect for this. I left about a 1/4" of the top of my card panel to use the sentiment from the Oval Foliage Wreath stamp set. For my next card, I used the stamp the Oval Foliage Wreath die that complements the Oval Foliage Wreath stamp set. I was amazed by the die, and then even more amazed how perfectly that oval stamp stamps through the leaves! I used some of the other dies to inlay the adorable Folk Elements. I wanted to add just a little more texture to the card, so I had some older Pinkfresh puffy sequin stickers I added along with some plain white twine. I have known Kinnari since she started Pinkfresh and am so proud of how much her company has grown. She is also very generous. 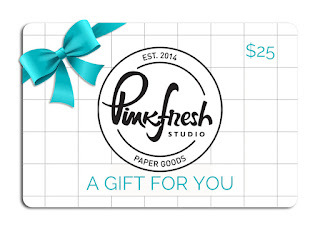 As well as giveaways on the Pinkfresh blog and Instagram, I have a $25 giftcard to giveaway! A winner for the giftcard will be picked from comments left on my blog. You can check back on the Pinkfresh Giveaway Page for all winners on Sunday, January 20th. First is the free die (Dainty Love Balloon) with purchase of $25+. There is no code necessary, and the die will automatically load into your cart once you hit the $25 threshold. Second promo is Pinkfresh Studio is offering free/discounted shipping from January 14th-17th on orders $50+. Be sure to use the code JANFREESHIPWITH50. Shipping is free in the USA, and $5.50 off for our International friends. ENJOY!!! Thank you so much for hopping along with the Pinkfresh January Release Blog Hop! Be sure to stop by the amazing Rebecca Luminarias's blog next. Here's the list to help you on your way. And good luck!!! I really love those folk dies and your cards are lovely. TFS! Cute cards! I love all the little cut outs from the folk elements dies. Oh, how fun are those folksy cards!! I really love your use of primary colors to make these look so "folksy"! Absolutely love both the cards; especially the second card with wreath stole my heart. Thanks for the great inspiration! LOVE these cards. They're different & unique. Love that folk art wreath!!! Your cards are wonderful. Beautiful folk art, love the fiesta of colors :)! The wreath is awesome. I like this company Patricia. Love the folk element designs and your cards. Paper piecing can be so much fun, and there are so many possibilities! I love what you did with the oval leaf die. Patricia these cards are so bright and wonderful! Perfect to send to a friend during the cold winter months. Thank you for sharing your creative use of the new release! They're just beautiful. These cards are so beautiful! Love the bright colours. These colors are so bold and vivid! I love your unique card designs too! so cute and fun in the great bright colors. Wonderful! love the great cards made by this new release. hanks for sharing the release ideas. Your bright, colorful cards are gorgeous. I think the Folk Elements dies are my favorite from this fantastic release. Fantastic cards! I love the bright colors, the stitching details, and the way you paired up the folk elements with the oval wreath!! Lovely cards! I really like the folk elements set as well as the wreath. for a Baltimore Album quilt (on paper). Wonderful creations with these new products! 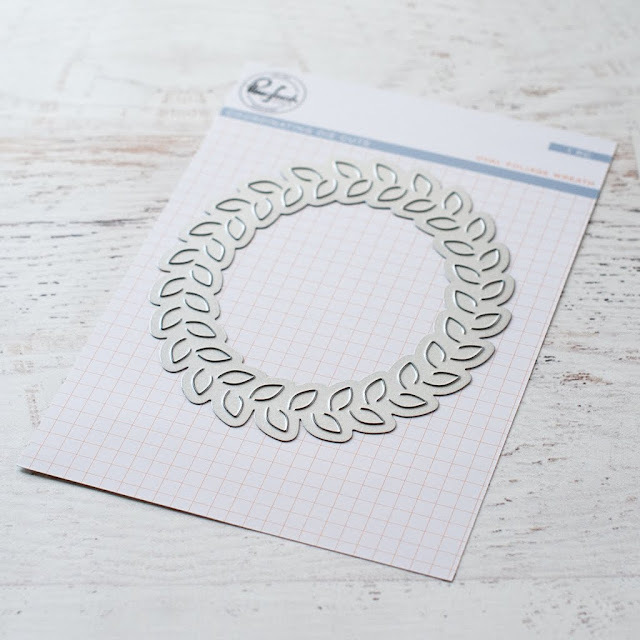 The Oval Foliage wreath set has so many possibilities for card-making <3! What a striking color combo! Such fun cards! Love these fun and colorful cards, the dies look great. Charming cards! I love the fun dies you used and the bold colors! Such great cards. Love all those happy colours. Amazing! Love the bold colors and designs - so perfectly suited to these folk themed dies. 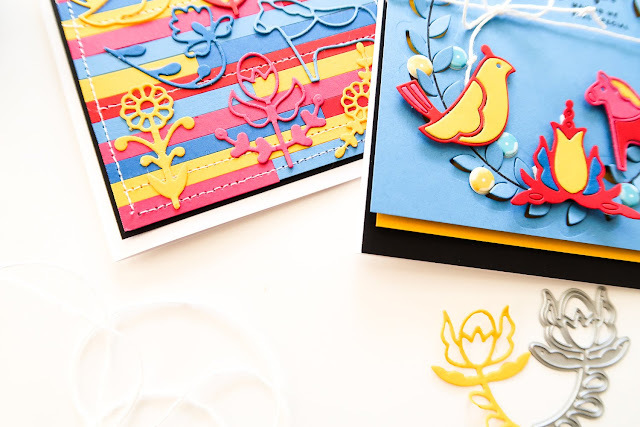 Beautiful cards, love the vibrant colors and the details on these Folk stand alone dies! The Folk elements are my absolute FAVORITE set of this new release! I was so happy to see how you've used them, and it is SO INSPIRING! I love the bright color choices too! Super fun cards. Love the Scandinavian look. Yea sure you bettcha. 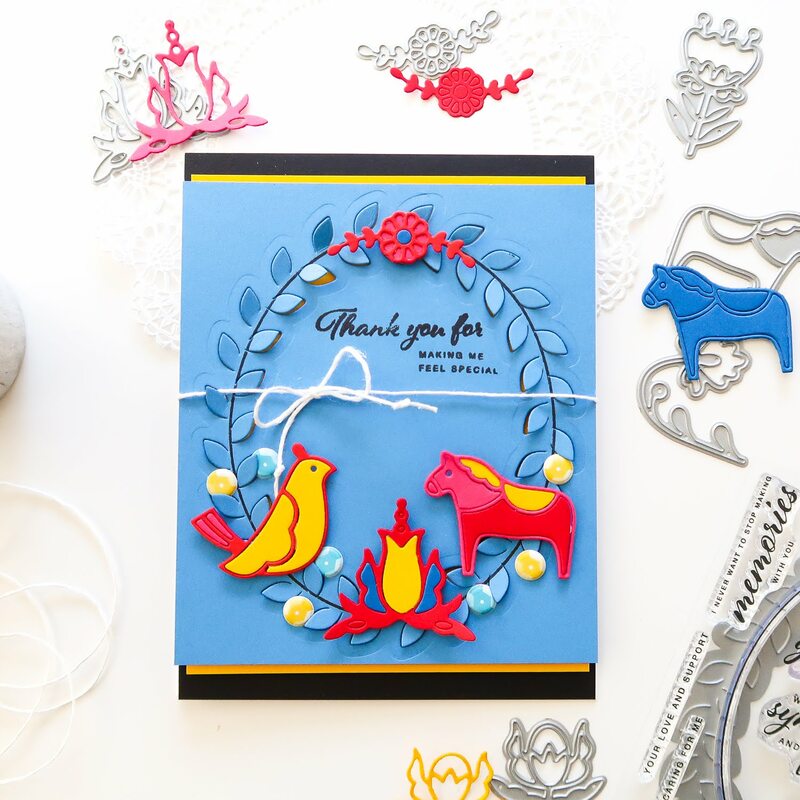 Thanks for sharing your beautiful, bright and cheerful cards! So fun. Oh my gosh this is so fun! 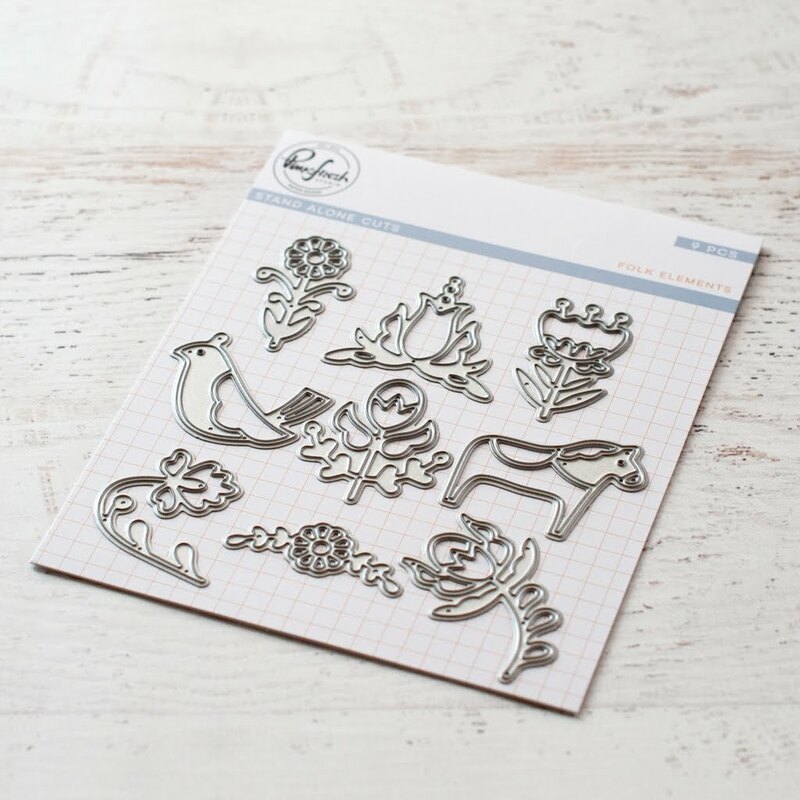 Love these folk elements paired with the oval leaf die!! Just fantastic!! Great job!! OMG what an array of cheerful, bright, folksy cards. Fabulous creations. And lovely photos too. Such fun cards! Love the oval leaf! I love the Folk Art die! Great cards! Loving your Folk Elements cards! OH..... such beautiful colors and my two favorite dies from this Pink Fresh release!! Lovely in every way!! What wonderful bright colors and I love those dies!! Beautiful cards anyone would love to receive!! 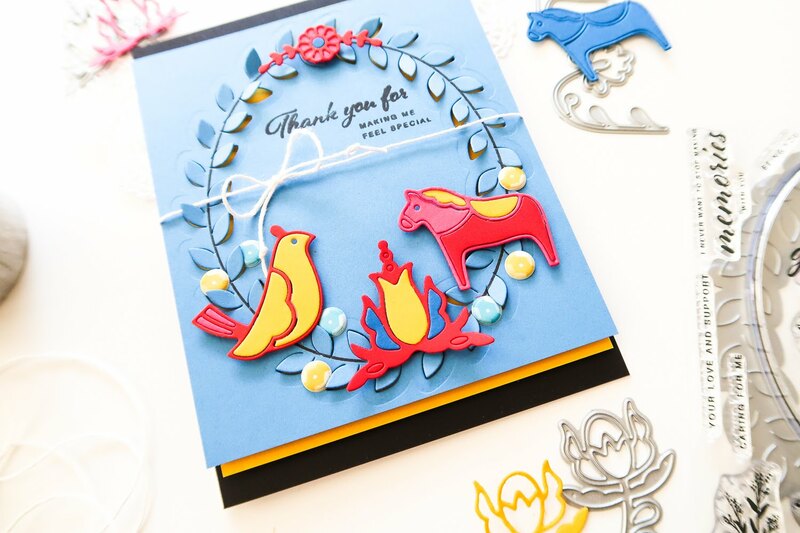 Love how you used the folk art dies to create your bright and cheerful cards! Beautiful cards! I love the bright colors! Love the colors in your Scandinavian card. SO fun with these cute dies and I love how you used them. This is a fun color palette! Cute cards and these dies seem like a lot of fun. The colour combos are so bold and bright! I especially like seeing the inlay die sets! 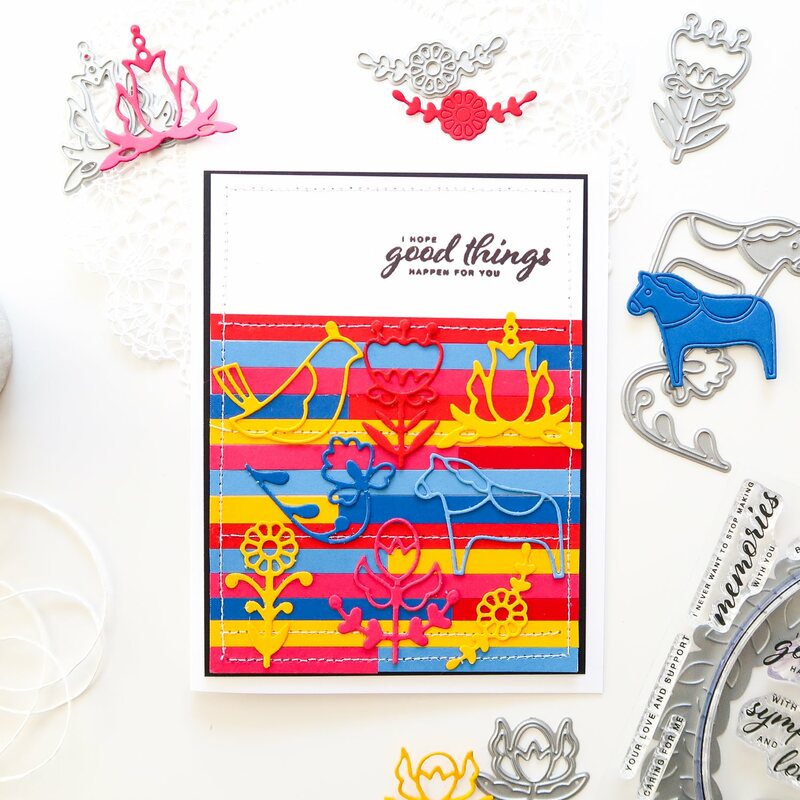 Love the colours on your cards - they're so bold and fresh looking! Awesome! The Folk Art figures are adorable and you did a great job with them color and layout are true to Folk Art. Love your choice of bold and bright colors! I love Scandinavian style/design and these dies are some of my favorites. I love the bright colors you chose for your cards! Great cards! I really like the Oval Foliage Wreath set. Both cards are beautiful and I love the effect that oval die makes on your second wonderful card. Love the bright cheery colors you used! Your cards make me happy just looking at them! I love the Folk Elements die set and the colors you picked make the cards look extra happy ! Your first card is really awesome.... Love the colors and how the stripes work with the die cuts. Great job! And the mixing of sets on the other card is beautiful! Fab layering and such pretty colors on your cards. Lovely style on this die set. 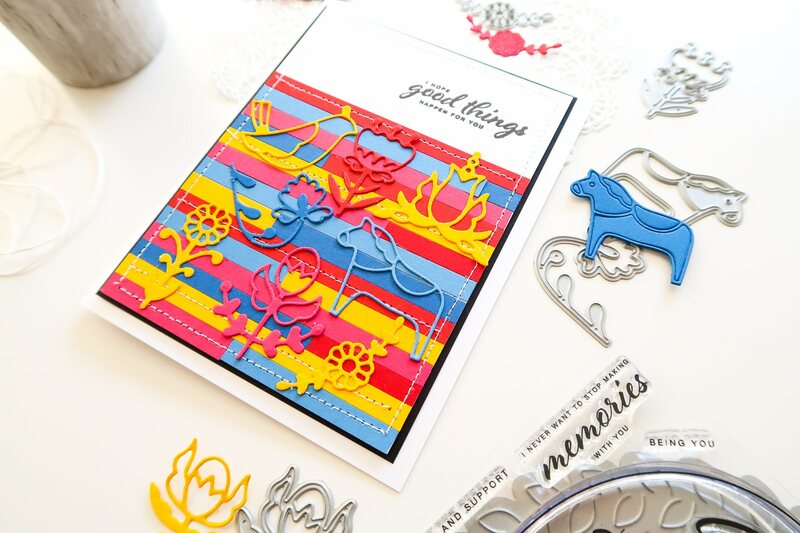 love the fun bright colors you used for this fabulous set of cards! Oh love the graphic look and bold colors on both!